Cars parked all day by BART commuters have been an especially difficult problem for residents of Brookwood Road, as well as for employees who work in downtown Orinda. Therefore the city has accepted the recommendation of the public works department and adopted a pilot program under which residents will receive permits that allow 24-hour-a-day parking, and the road will be limited to four-hour parking, except for existing areas already limited to two-hour parking, which will remain as is. The parking restrictions will apply from 6 a.m. to 6 p.m. Monday through Friday except holidays. There are 47 street parking spaces on Brookwood Road and there are 94 residential units. The residential units are a mix of single family homes, with condominiums at 63 and 72 Brookwood. There was a lot of discussion between staff and the council on how many permits to issue for the pilot program. After a lot of back and forth, the council decided to issue two permits per household for the first 30 days of the pilot program, and after that up to four per household if requested and available. The permits allow all day parking, but don't guarantee that a parking space will be available. Many of the residential units do have at least one off-street parking space, and some residents will not need the permits, if, for example, they commute to work and return home after 6 p.m. The pilot program will begin when the new signage is in place and will continue for six months. If the pilot is successful, the permit program would be made permanent. The cost of a permit will be $80 per year, reduced to $40 after July 1. The fees for the permits will offset the costs of implementing the program, which include new signage and enforcement, in addition to the costs incurred by the city in conjunction with a contract with Turbo Data Systems to issue the permits. Permits will be issued on a first come, first served basis. There is concern that the BART parkers displaced from Brookwood Road will migrate to nearby areas, such as Spring Road, so the city will be monitoring that and the council will re-examine the issue in about 45 days. Some enforcement efforts will be reallocated from different areas to focus on downtown Orinda. 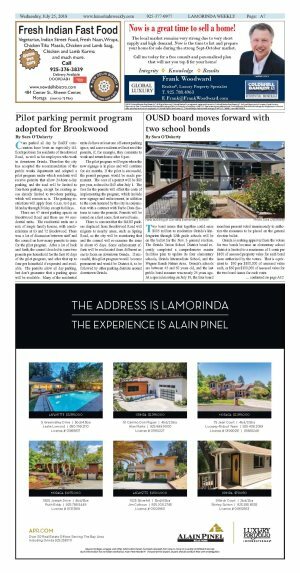 If successful, this pilot program would become permanent and would be District A, to be followed by other parking districts around downtown Orinda.